Last club tournament of the year with the top four guys within arm reach of AOY Championship. Bob Pharris going into the tournament in the lead goes as a co-angler with his boat already ready for storage for the winter. Some say may that be to their advantage? NOT Bob fished with Scott Gordon and on just the first few cast he had his first keeper from the back of the boat. Just minutes later he had a couple misses on a buzz bait. Here Bob and I are talking how cold it was feeling and he was getting blow ups on a buzz bait. Before we left the area on one lonely piece of wood Bob catches his second keeper on yes a buzz bait. But for us once the sun came up and the wind picked up our bite completely went away until around 1pm. Bob said there was a stump field close by in which we could give a try. I gave Bob the front of the boat to line us up. Within minutes of being there I managed a keeper fish and not long afterwards a second both on carolina rig. Then right before the lady sang for the day Bob boated his third fish of the day. 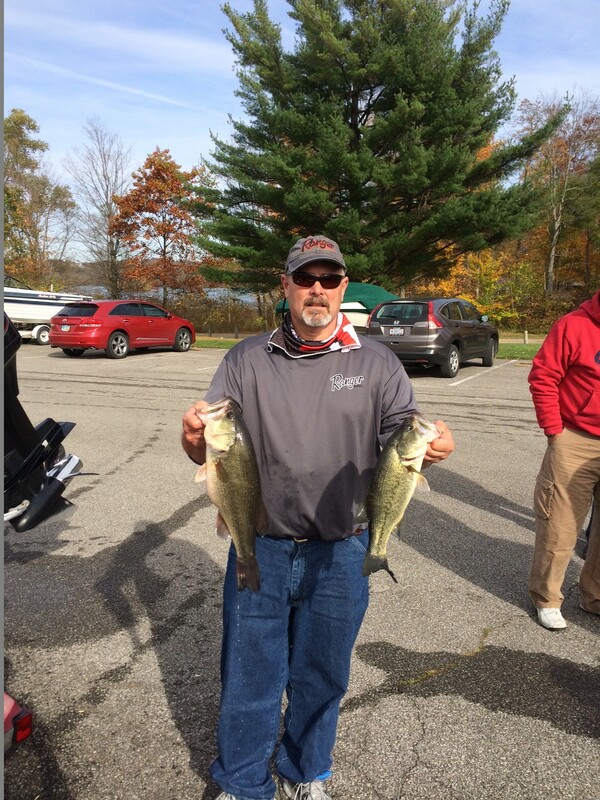 Karl Geugold took 1st place Top honors for the day with two nice fish weighing 6.13. I think he was practicing for ledge fishing at Kentucky Lake? Nice Job Karl! 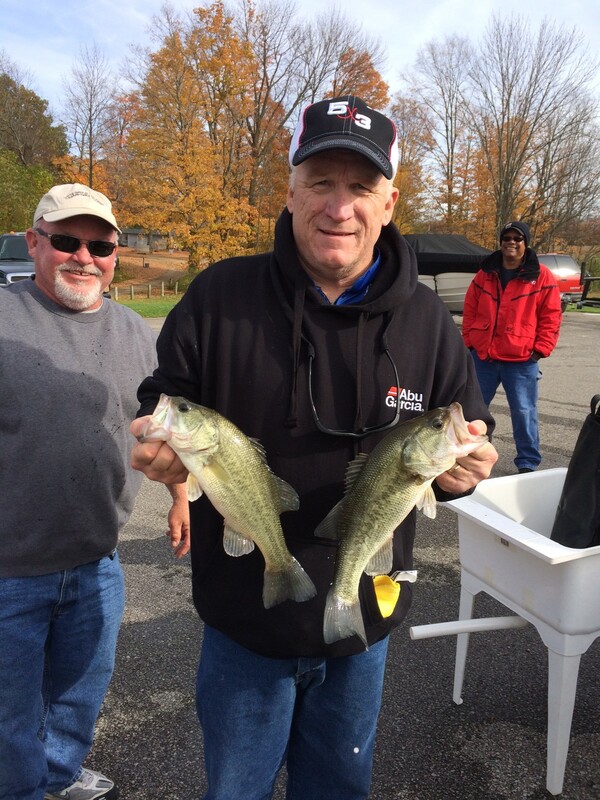 Scott Gordon holding the two fish finished 4th, his Guide for the day was Bob Pharris to his left with all smiles finished 2nd place and WON 2014 AOY. Will Presley finished 3rd place for the day. Seem’s like that Skeeter Boat is treating him well too. To wrap up the day we had 6 guys weigh in 11 fish at 22.4 pounds. 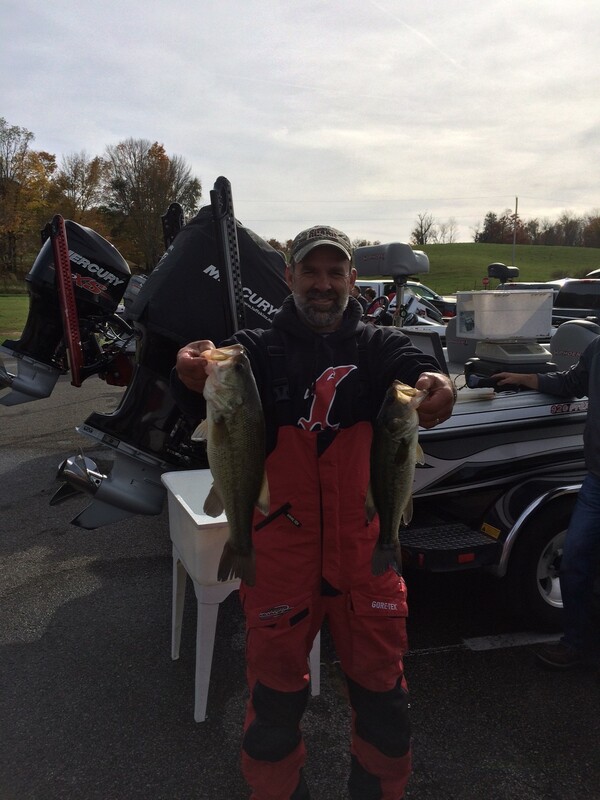 This entry was posted in Clear Fork Lake, Uncategorized and tagged Clear Fork Lake, Columbus Bassmasters. Bookmark the permalink.